Every child is different when it comes to potty training! One thing that I learned early on with my first kid is that just because I am ready doesn't mean that he is. Being aware of readiness signs can be helpful when you are trying to teach your child how to use the potty. Learning how to use the potty starts long before your child ever sits on toilet. Right now my 18-month-old is fascinated by the potty. She loves to talk about the potty and what happens when we go to the bathroom (using only a language that I can understand, of course! :)). She also loves to hand people toilet paper when they are going to the bathroom. She is constantly observing and learning as she watches what is happening. It is rare that the grown ups get to go to the bathroom alone at our house and that is actually helpful because it allows for learning opportunities! Today I am going to share 10 signs of potty training readiness that we have noticed. 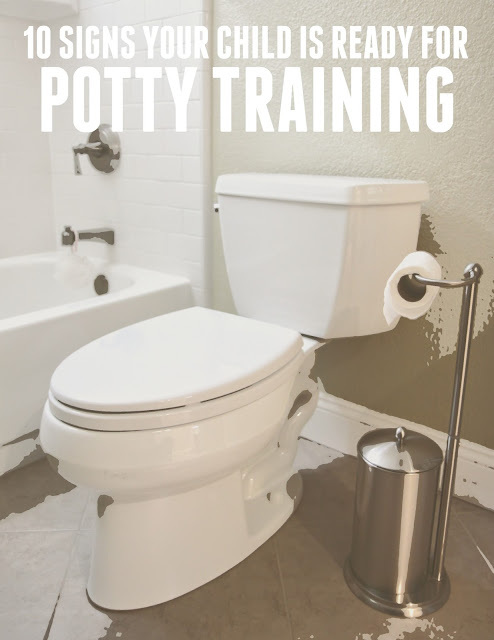 I am not a potty training expert and have only trained three kids, so if you have more expertise than me about readiness, please chime in and share your wisdom! Kids are pretty smart and when they are ready to use the potty, it is usually a positive experience that is a lot more successful than when they are not ready! Here are some signs of readiness that we have noticed in our home! 1. Noticing that a diaper is wet or dirty and pulling it off or pulling at it. Usually we try and respond quickly so that messy diapers don't actually get taken off by toddlers! Toddlers that don't like messy diapers and try and pull it off or point at it or pull at it are often ready for potty training (though not all!)! 3. Staying dry for longer periods of time. This is especially noticeable at nighttime for my kids. Once they can go all night long with a dry diaper, then we know that they are ready to sleep without a diaper at night. Kids that start dry for longer periods of time during the day are also often ready to start potty training. 4. Telling a parent that they are messy or wet before or after they have gone to the bathroom in their diaper. It is so helpful when kids are able to communicate BEFORE they go potty in their diaper. My kids usually take a long time for this to happen! Often they will tell me right while they are going, which is still awesome because that means they can recognize it! This usually happens for my kids when they are around other kids their same age (or younger) that are potty trained. When my son was at a Mom's Morning Out class he was fascinated by the other kids that went on the potty, so he started taking a turn too. It was fun to see him copy them! We love to have books about the potty available starting pretty young so that kids can learn about what happens and use some of the vocabulary. 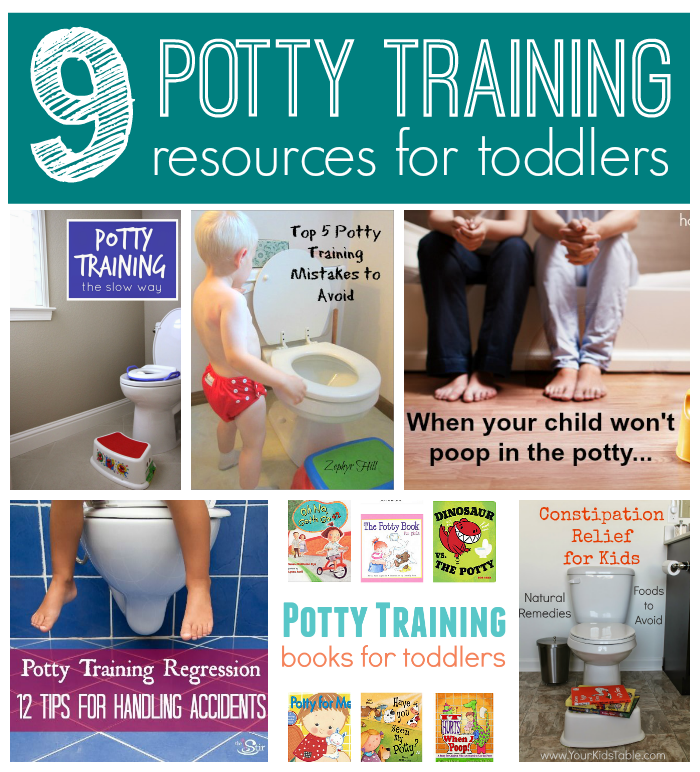 Allie at No Time for Flashcards has a great list of Books about Potty Training for Toddlers. Interest in sitting on the potty can also be a sign that kids are ready to start using the potty more regularly. I always let my kids "try" whenever they ask and then give them a lot of encouragement and cheering when they try and go potty. **BONUS 11. Mom & Dad (or caregivers) are ready to help the child learn to use the potty. I hope that potty training your child can be a really positive experience for you! Here are 9 of my favorite potty training resources that you can check out.